ND: Yag Lenses: Directed Light Inc. Lenses are used in Nd:YAG laser systems to focus all the beam’s power into a very small spot which generates the high power densities required to cut, weld or drill many high alloy materials. Also, small focused spot size is important when narrow kerfs and heat affected zones are required, or when drilling extremely small diameter holes. The design variables that will affect the performance of an Nd:YAG laser lens are focal length, diameter, shape, material and coating. Focal length affects both spot size and depth of focus. In general, a shorter focal length will produce a smaller focused spot and a shorter depth of focus. Usually, the specified focal length is a compromise between desired spot size, penetration depth, and workpiece clearance. Lens diameter is important for two reasons. Higher power lasers require larger diameter lenses to prevent thermal overload. Also, at any given focal length, a larger diameter lens will yield a smaller focused spot, if the incoming beam is expanded to fill the larger lens. Bi-convex lenses, as their name implies, have a convex curve on both the incoming and outgoing surfaces. The curves are generally unequal and are designed to yield the optimum focused spot. This optimized design, sometimes referred to as “best form, ” will yield a smaller focused spot than a plano-convex lens. Directed Light recommends bi-convex lenses for most Nd:YAG applications. However, we can supply plano-convex lenses for less critical, cost-sensitive applications. An unequal, bi-convex lens should be oriented with the larger radiused (flatter) side toward the workpiece. Plano-convex is the simplest and least expensive lens shape. It is only recommended for applications where achieving the smallest spot size is not critical or at relatively long focal lengths when the benefits of a bi-convex lens are reduced. A plano-convex lens should be oriented with the flat side toward the workpiece. Achromats are complex focusing optics consisting of 2 or more lenses. They are corrected for spherical aberrations and are diffraction limited. For critical applications, they generate the smallest possible focused spot size, even better than bi-convex lenses. Achromats are used in many of the newer, fiberoptic delivered, pulsed Nd:YAG laser systems. The individual lenses in an achromatic optic assembly can be separated from each other in a mount. This is called an “air-spaced” achromat. However, improvements in optically transmissive cements have made cemented achromats practical for many laser applications. Cemented achromats can be supplied without a mount. Fused silica is the material of choice for most Nd:YAG laser lenses. It has very good optical characteristics – low absorption and high transmission – at the 1.06 micron Nd:YAG wavelength as well as in the visible spectrum. This allows highly efficient transmission of the laser beam and good image quality for camera monitoring systems. It also has excellent thermal conductivity which helps prevent thermal overload. 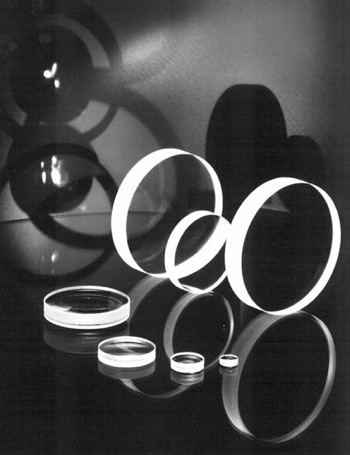 All of Directed Light’s most commonly used Nd:YAG lenses are manufactured from extremely high grade fused silica. It is recommended for all Nd:YAG applications. For low power or noncritical applications, less expensive materials, such as BK7 glass or pyrex, can be used. All Directed Light’s standard Nd:YAG lenses have highly efficient antireflective coatings on both surfaces. This reduces surface losses to nearly zero for the best beam transmission possible. These coatings have extremely high damage thresholds and are quite durable. However, care should be taken when cleaning and handling.